This last weekend, after a good solid week at "home", I traveled by train up to visit Michael. We got alot done, meeting with his Pastor and spending time with family as well as talking over wedding plans. 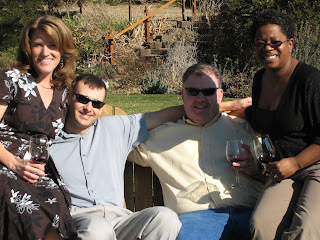 The picture includes Michael and Me as well as his brother Jim and Jim's wife Tamara. Jim took us on a tour of a few local wineries in the Paso Robles area. It really was our first time doing the day with Jim and Tamara and long overdue. While we were at it we kept our eyes out for good spots for our California wedding reception. I got to attend youth group for the second week in a row! wow! lol. We had a guest speaker who related to the students his high school testimony of being shunned by his local youth group. It was a stunning testimony and very applicable to our students right now. While visiting Michael this weekend, we attended his church there and I looked around for the possibilities of getting involved in youth ministry there. Looks like there is a small youth group and youth pastor so gonna have to have a talk with him! Tomorrow I fly over to Florida, and after a brief visit with my Grandma Benny in South Florida, I'll drive up to Orlando and attend the weeks events. First the Tri-annual Recruiters convention followed by the Next Gen retreat over the weekend. I get back to CA on Sunday. Prayer items are for the workshop that Ron, Tracy and I give on recruiting the Next Generation. Also that during this time as I ask God for direction about the next phase of my life married, that He would answer and show me how I should arrange my job description. Thanks for looking in on me again!